Pavement is made up of stones, fine sands, and asphalt cement. The cement acts as the “glue” to hold all of the aggregates together and provides the pavement with the rich, black color. As the pavement ages, the binder begins to oxidize with exposure to sun, rain, snow, and other elements – this is shown by the pavement color fading to gray. The oxidation makes the pavement less flexible and cracks start to appear from loads (such as cars) and shifts in the weather (such as freezing). When you combine the deterioration with exposure to harmful chemicals, such as motor oil, landscaping or household chemicals. 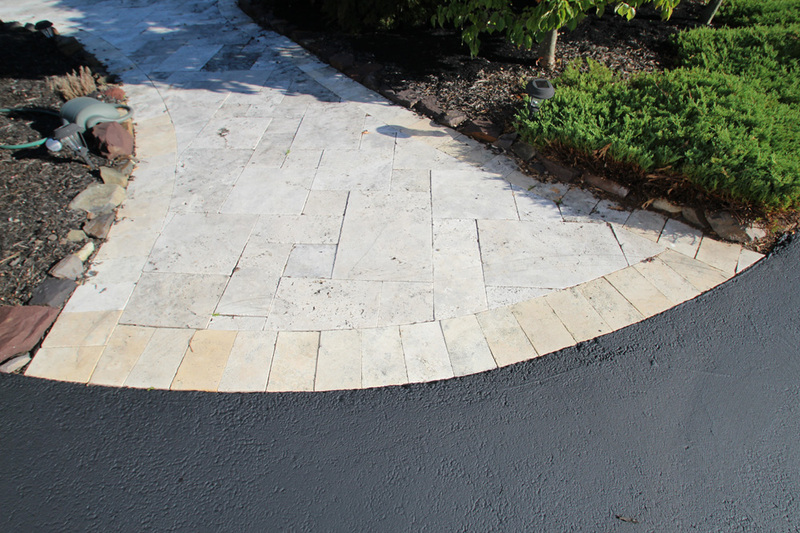 To prevent the harm caused by leaving your pavement unprotected, sealer is applied to “seal” out the sun’s UV rays, rain, snow, and harmful chemicals. In fact, studies have shown that maintaining pavement with sealcoat will more than double the life of your driveway and will prevent the need to repair or replace it for many years. To learn more go to seal coating to read about our sealcoating service. Every driveway is different. 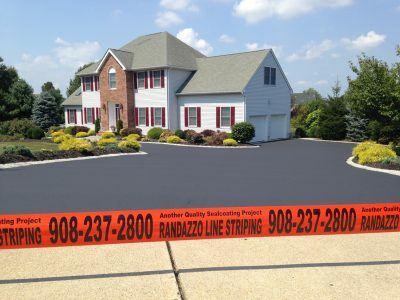 Our asphalt sealcoating estimate is based on the size and condition of your driveway; we use our standard pricing model to give you the most competitive price possible. Give us a call at 908-237-2800 or email us for a free sealcoating estimate and we immediately assign an estimator who will provide pricing within 2 to 4 business days. The estimator will measure and evaluate your driveway, write up a quote and leave a sealcoating package at your front door. Ask us about our neighbor discount for additional savings. We provide our services to customers in Hunterdon, Somerset Counties in New Jersey. How will you fix the cracks? Cracks are an open door to moisture and other harmful chemicals to infiltrate into the pavement’s base and ruin your driveway. As moisture expands and freezes, the pavement will crack and the driveway will fail. To prevent this, we install a high-quality, hot applied crack and joint sealant to your cracks before sealcoating. We will then apply a liberal coating of Black Beauty sand to promote sealcoat adhesion (temperature permitting). In most cases you will see a shadow under the sealcoat where we applied the crack sealer. This cannot be avoided, but it is better than having the cracks worsen to an unfixable state, leading to complete driveway failure. What can you do about my ugly oil stains? Oil stains can vary in severity. For highly visible oil stains, we heat flash the area and then apply by brush an oil spot primer directly onto the stain to block it from the new layer of sealcoat. While the primer is successful at blocking most stains, unfortunately not all stains can be completely removed. Our experience has shown us that a brushed application of sealer lasts longer than a sprayed application. 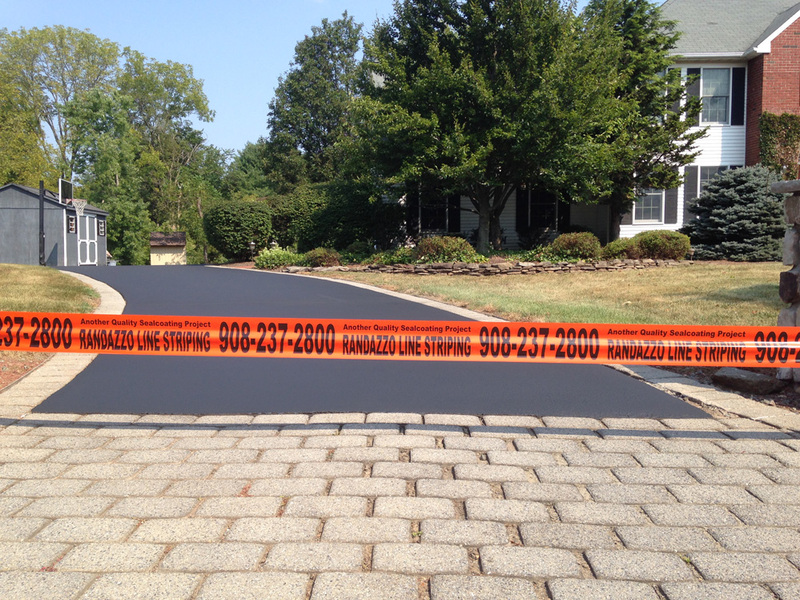 While it is possible to spray a driveway we don’t recommend it due to the proximity of your house, landscaping, etc. How do I pay for my driveway sealcoating? 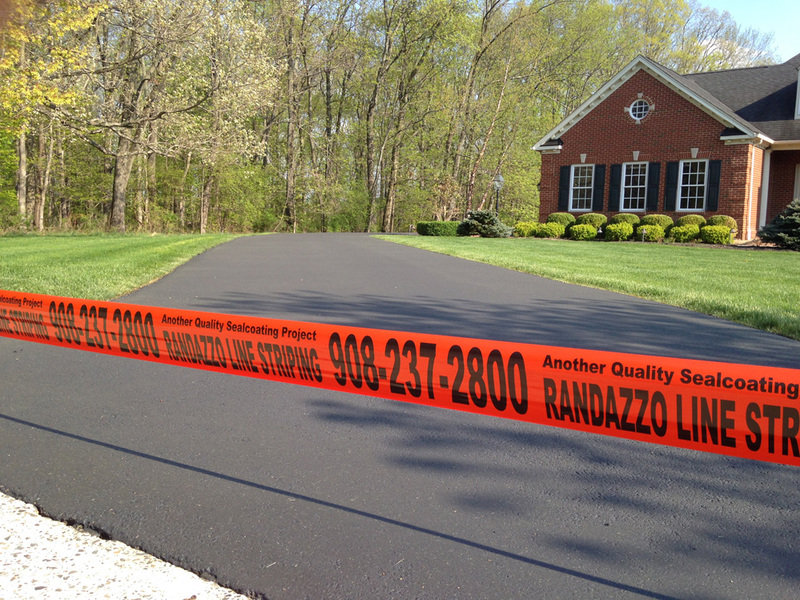 Randazzo Line Striping accepts checks, Visa, Mastercard, and American Express. If paying by check, the payment must be left at the house on the day of service or a pre-payment can be made through our office for credit cards. How long do we have to wait till we can use our driveway again? While dry times vary depending on sun and the temperature, we recommend keeping your driveway closed to vehicle traffic for 48 hours. In most cases, you can walk on the driveway within 12 to 24 hours. If you have any questions please don’t hesitant to give us a call at 908-237-2800. 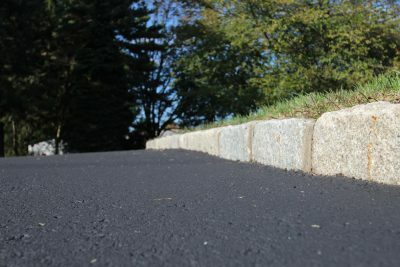 How will you prevent sealcoat from getting on my house, sidewalk, curbs, etc.? Randazzo Line Striping crews are professionals, most with many years of experience. We use caution next to your house, sidewalk, Belgium block curbs, etc. In the unlikely event that a crew member did get sealer somewhere, it is not supposed to be, feel free to give us a call at 908-237-2800 and we will send someone out to resolve the issue. What if sealcoat gets on my grass, will it harm my lawn? We apply our sealer via brush so there should not be any sealer on your grass when the project is completed. In the unlikely event that sealer did get on the grass, rest assured that sealer will not harm the grass. Two to three mowings and the sealer will disappear from the grass. What is with the tire marks? Sealcoat takes time to fully cure. 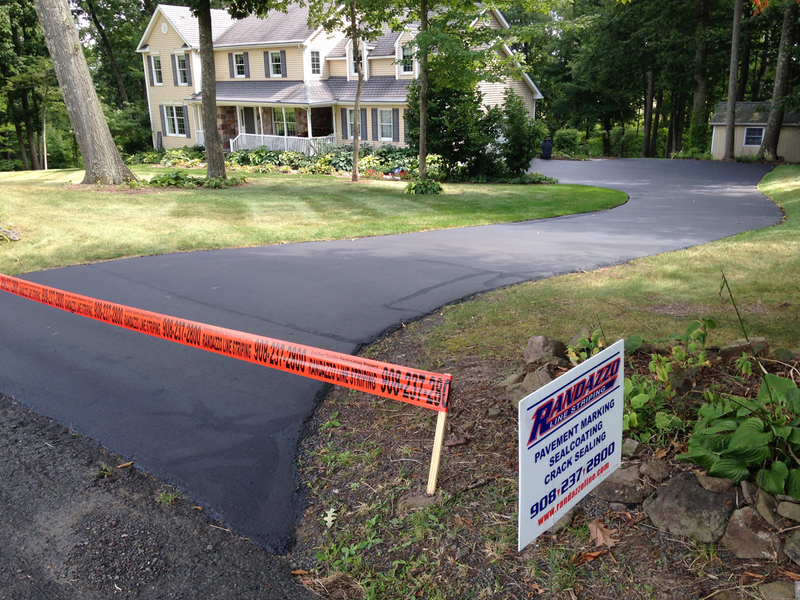 When you reintroduce car traffic to the recently sealed driveway you may see some tire marks, especially during humid summer months. Once the sealcoat material cures completely (approximately 24 days), the tire marks will disappear. Some sections of my sealcoating dried to a grey or brown color. What happened? 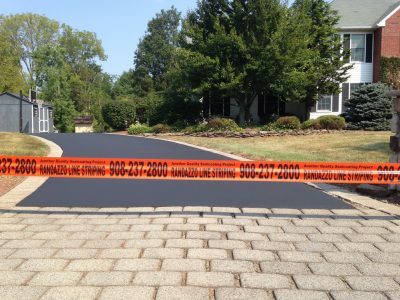 Just like any sprayed or liquid-based coating, the sun helps sealcoat dry and cure. 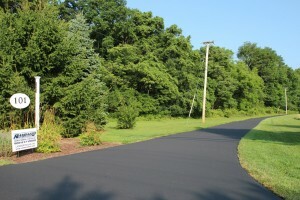 In an area of shade, such as under a tree, the sealcoat material may dry differently than the rest of the driveway. 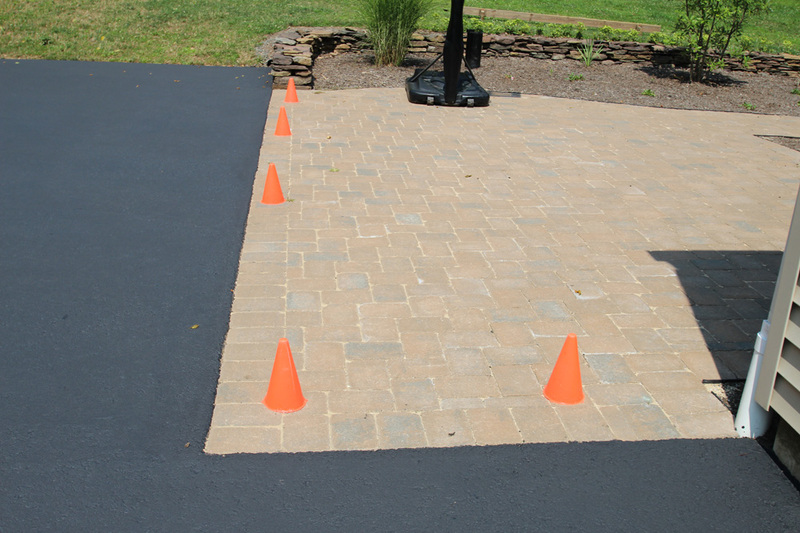 In most cases, overtime the sealcoat will dry to a uniform appearance and color. I like your estimate/price. How do I move forward? When can you schedule my driveway sealcoating? To move forward, please sign the estimate and then email or fax it back to us for prompt scheduling. Randazzo Line Striping operates sealcoat crews throughout the Hunterdon County Area and its surrounding areas. We can find a time to suit you, depending on your needs. Our scheduling coordinator will contact you within a week to discuss scheduling and confirm dates with you to ensure the process goes smoothly. Please keep in mind that all schedule dates are weather permitting. In the unlikely event that you do not hear from us within a week of your accepted proposal, please give us a call at 908-237-2800. How will I know if the scheduled date changes? 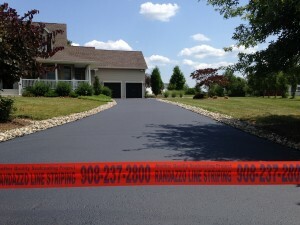 In the event that we need to reschedule your driveway sealcoating, we will contact you. If weather or other variables affect your scheduled date, one of our scheduling coordinators will contact you to discuss alternate dates. Please keep in mind that our work is weather permitting. If you have any questions please feel free to give us a call at 908-237-2800. What time will you be coming to our house? 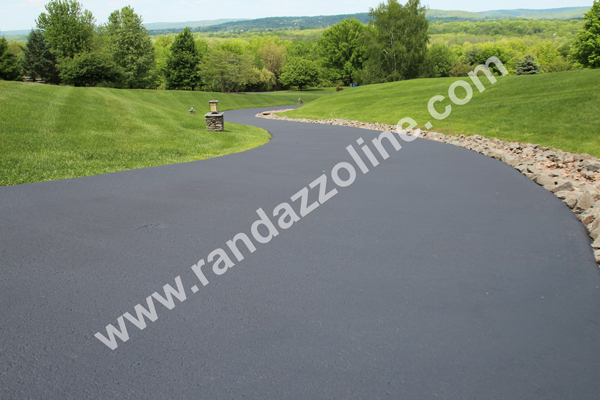 Our driveway sealcoating crews do several driveways per day; therefore it is difficult to give you an exact time when they will arrive at your driveway. If you need to, please feel free to call us at 908-237-2800 to get an update of the crew’s daily progress to help get an approximate arrival time. What should I do with your yard sign? Yard signs are one of the most inexpensive yet effective ways to advertise for us. Leaving these signs up for a week or so allows us to keep our costs down, which we pass along to you in our competitive pricing. Please leave these signs up as long as you like, and we appreciate your cooperation in showing off our work and your driveway. Do we need to do anything to do to prepare for sealcoating? The only thing we need from you as a customer is to clear your driveway of all vehicles, kid toys, planters and other items. Should your driveway have any kids chalk or fertilizer please wash these items off a few days prior to sealcoating. Also, please have irrigation turned off at least 24 hours prior to driveway sealcoating. Other than the items mentioned above, we do not need you to clean or prepare the driveway in any other way. We will clean and prepare the driveway for sealing when we arrive. Does Randazzo Line Striping do pavement repairs? Our repairs are limited to crack sealing and small pothole repair. If you need something more extensive please let us know and we can refer you to a reputable paving company. When should we have our driveway sealcoated? Sealcoating must be performed when the temperature is over 50 degrees (including night time). Weather permitting; our typical season is April to October.